A while back I told you about reorganizing our assembly area. Instead of putting parts on the shelf in part number order, we are putting them in sub assembly groups. We can do this because of computers and location IDs. This reorganization also includes updating all bin labels with barcodes which allows us to scan it with our iPhones and get all of the info on that part from our data base. I like designing data bases so a few years back, I designed one for grocery shopping. It had a list of all of the items I normally buy sorted by home location. I could go to my pantry and compare the list to what I had on the shelf and select any items that were low or I was out of. Once all of the items were selected I would go to my shopping list where those items would appear in store aisle order. This would save me about half an hour per shopping trip. All was great until my grocery store reorganized and my aisle locations were all wrong. I wasn’t saving any time and I was bouncing all around the store. Then Publix introduced their own app for creating a shopping list. You can scan the barcode on the label and the item is added to your list and it automatically puts them in aisle order. As you put the item in your cart, you can check it off the list. There is one problem though. You have to remember to scan the item before you throw away the package and if you are missing an item, you can forget to add it to the list. But I had a solution. I would take my old data base of items I normally purchased which were sorted by home location and add the UPC barcode to the data base. That way I can compare my list on my iPad to what is on the shelf and select the items I need. I can then scan those items on my iPhone Publix app to make my shopping list. Easy right? Wrong. I thought I could go online and download a font for the UPC barcode. The problem is there is not one set of characters in a UPC barcode, there are five. The first set is the number system which is a single digit that includes a guard bar. This digit indicates the type of product such as a pharmaceutical or a weighed product like meat or produce. The second set is a five digit manufacturer’s ID then there is a guard bar. The fourth set of five digits is the product ID and the last set is a check digit also with a guard bar. You can’t just type in the number using a single font and come up with the correct barcode. You have to first convert the numbers into different characters for each set of digits. 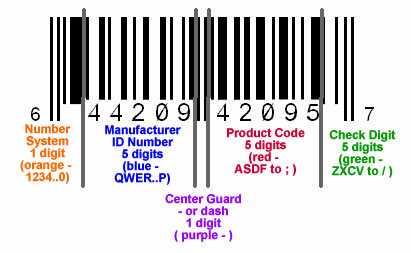 So if your barcode number is 644209420957, you would have to type 6RRWPO-FS;LGM and use the correct font. Each of the five sets corresponds to a row on the keyboard so I had to write a routine that would take the actual number and convert, ie if the second digit is a 1 replace it with a q then repeat that for every number and then repeat the whole process for every digit. This actually turned out to be pretty easy with a lot of copying and pasting. So now I have a data base where I can either enter or scan a UPC number and it will duplicate the actual barcode that I can use in any application the can scan UPC barcodes, like my Publix app. I realize that this is probably one of the most boring blog posts I have ever done and I worry about what it says about me because I find this kind of stuff fascinating. 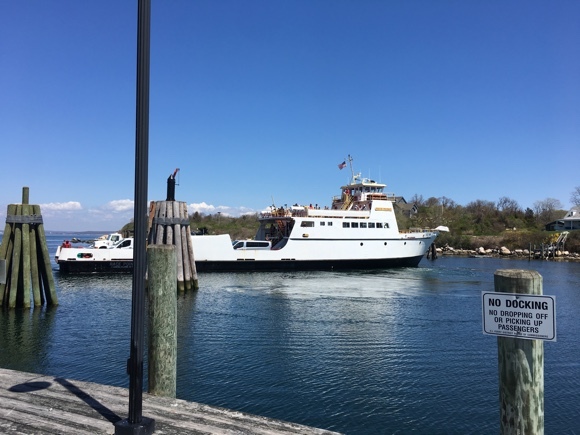 A few weeks ago, I told you about my visit to Fishers Island New York. An island between Connecticut and Long Island, accessible only by a forty minute, $220 ferry ride. If you have a commercial vehicle, you have to make an appointment. While I was on the phone, making the appointment, I had to give them my address in Florida. When I did, they asked me if I knew that this was the Fishers Island in New York. Last week, I delivered a set of machines to Fisher Island Florida, a small man made island just south of Miami Beach also only accessible by ferry. Fisher Island Florida is about the size of Fishers Island New York’s golf course and it has its own nine hole, perfectly square golf course right in the middle, surrounded by homes and a hotel. It also boasts that it has the highest per capita income ($2.5 million) of any zip code in the United States. That sounds impressive and their are at least a dozen celebrities with homes there but one of those celebrities is Oprah Winfrey. That probably means that everyone of the other 467 residents could be dirt poor and they would still have the highest per capita income. It has two ferry services, one for the residents which is about a mile. It uses several ferries and leaves every five or ten minutes. 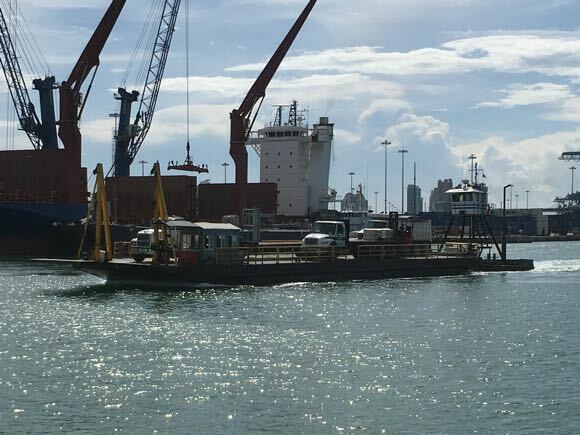 There is another ferry for commercial vehicles which does not require an appointment but does require pre-approval which must be done several days in advance. There are four ferries which leave every 20 minutes. The commercial ferries are just barges with a small custom tug boat pushing it. Both ferries are free. Regular readers of my blog know Darwin. He was my General Manager for almost twenty years. He retired in 2014 but still comes in two mornings a week to help out. It was supposed to be for special projects like the one quarter scale model of the Peerless 7000 he built, but we have been so busy lately that he is mostly doing production work and new employee training. Darwin has a BS Degree in Chemistry. He almost did not get it. He dropped out his senior year to go west and become a hippie. He wised up after a few years and went back to finish up his last few credits. He realized however, that he hated chemistry. His first real career move was to work for a small company that made specialized printing machines. This is where he first learned the machinist trade. He also realized he did not like the weather in Michigan, so he moved to Florida. 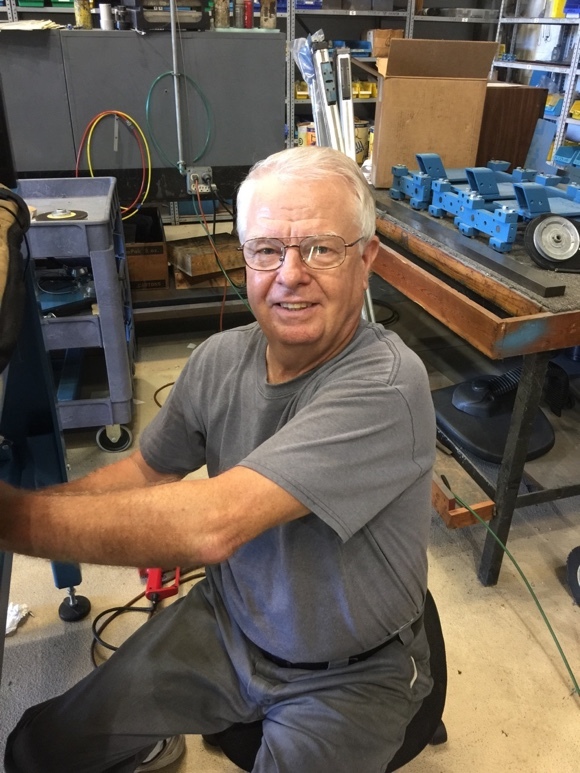 He had several machinist jobs and was eventually promoted to supervisor. When his girl friend at the time (a college professor) decided to take a job in Alabama, he liked Florida too much, so they parted ways. He was burned out from the high stress job of supervising at what could be called a sweat shop so he quit and took a year off. At the end of that year, I was looking for a lathe operator/supervisor. We only had two other people in the shop, so there wouldn’t be much supervising. He took the job even though it was a step down but he saw that it would be less stressful and he tells me now that he saw potential. I was a little concerned at first with his work. It seemed like it took him twice as long to make parts as our old lathe operator. What I did not realize until later is that he was making the parts correctly so that when he assembled them, they went together in about one tenth the time without any time consuming rework. This gave me a very high confidence in his ability. Darwin began right after I introduced the Peerless 2000. It was pretty crude by todays standards but we continued to make improvements. He had a major impact on both the design of our machines and the processes we used to make them. Since we are building machine tools to do metal working (grinding), I would always go to him and ask “How would you do this in a machine shop?” We would discuss and design. 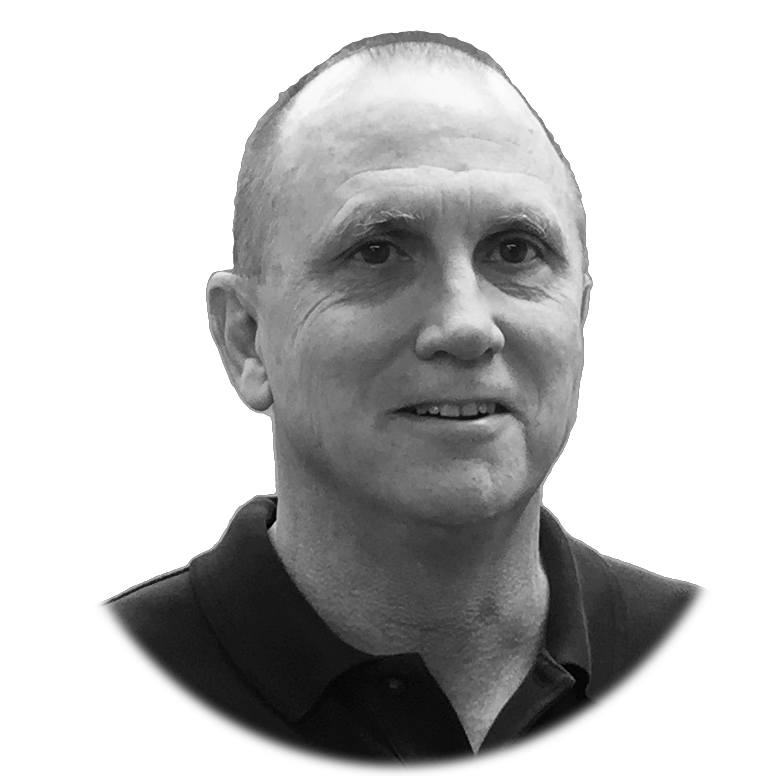 He would then build prototypes with just the most basic sketch. My 3D CAD software at that time was not very good and it was a major chore to convert any design into engineering drawings. We introduced the Ideal 1000 in 1997 and it was made until 2006. In all that time, there were several parts that never had drawings. I had to rely on Darwin’s ability and memory, which by the way is amazing. He can remember details and dates like no one I know. By this time, we moved to our new building and had a crew of about a dozen employees, so Darwin spent all of his time supervising and helping me design improvements and new products. 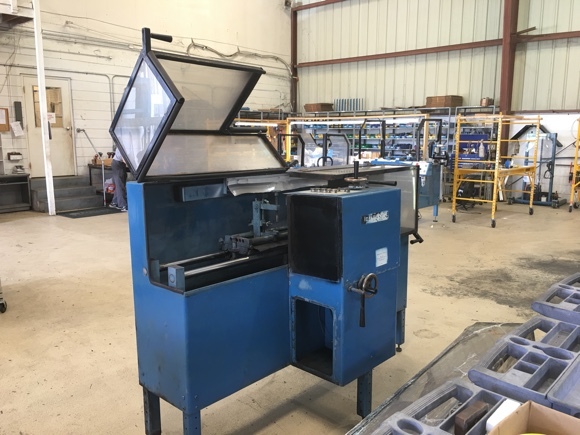 We were very prolific over the next few years which included the Ideal 1100 (replaced), the Peerless 7000, the Ideal 6000, the Simplex 500 Lift Table, the Simplex 75 Front Facer, the Simplex 85 Rotary Blade Grinder (discontinued), The Simplex 5000 Rotary Blade Mill (two versions), The RHOC, The Rack and The Stone. All of that was done after the economy tanked and we laid off most of the shop employees. Darwin was a major contributor to all of this but it was also made a lot easier with the advent of much improved CAD Software. I also integrated our document control into our main Accounting and Manufacturing Control data base. As I said, Darwin retired in 2014 but he still comes in two days a week. I have several special projects for him including a scale model of an Ideal 6000 and a major new option for the Peerless 7000. When he is not at the shop, he is taking care of his hundreds of Orchids. I designed a data base for him to keep track of all of his orchids. 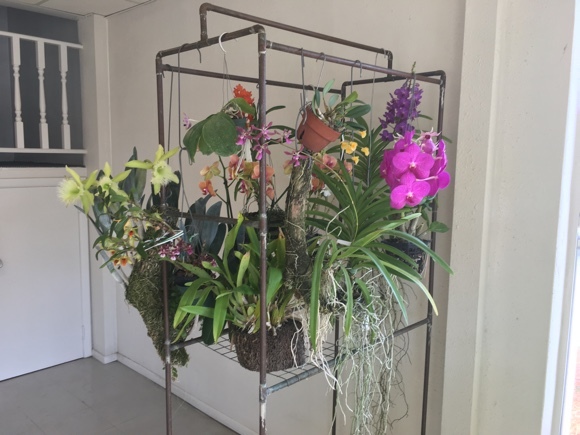 We have the rack in our lobby where he rotates them out with what ever is in bloom. He belongs to a local club where he won best in show. He also met his current girl friend at the orchid club. He also travels a lot and I believe just enjoys life. Happy 70th Darwin! Thanks for everything. Last summer, I blogged about reorganizing our assembly shop. I rearranged the tables and resurfaced the tops with a hard wood panel that is easy to clean. Instead of using carpet for our soft surface, we use towels which are washed regularly. The fasteners were moved to a single rolling bin cart with bar code labels for easy reordering. Three new rolling tables were added, one for electrical assembly and one each for reel grinder final assembly and bed knife grinder final assembly. LED lights were added over most of the tables. I equipped one of the final assembly tables with a battery pack so that the light would work with out being tethered to an extension cord. It has not been fully tested but if it works out, I will add the same to the other assembly table. I had to stop working on the project because we got too busy but now I am back on it. When we bought the company in 1988, It had several different product lines. The inventory was kept in the back of the shop and had to be pulled and moved to another part of the shop. It was poorly lit and filthy. You had to spend a fair amount of time just cleaning the parts before you could use them. There was no computer tracking, so we did a physical count before each batch to figure out what parts needed to be made or purchased. Not very efficient so one of the first things I did was move the components for our more popular products to the assembly area and arranged them by part number, which made them easier to find and track. Things got a little disorganized as we added new products but it was not too much of a problem because by this time, we had the inventory computerized. When we moved into our new building in 2005, it gave us a chance to straighten up but we kept the parts in part number order. 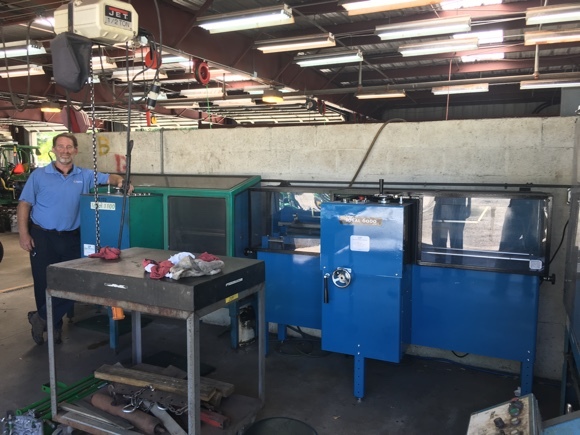 In 2008, our overstaying tenant finally left and we were able to move welding and fabrication into the new area and fully utilize the assembly shop for assembly. At that point, we separated the bed knife assembly and the reel grinder assembly into two different areas of the shop. This meant that we could have the same part in two different locations. We also had a flurry of design activity which meant that parts used in a subassembly were not kept together if they were kept in part number order. I added inventory location capability to our software so as we added parts, we could put them where it made the most sense. This left us with a hybrid system where legacy parts were in part number order while new parts were placed more logically. Now I have begun relocating all of the parts by subassembly. This makes it much easier to pull components or just check on the status of parts. We still do all of our shortage reports on the computer but this makes for an efficient double check (it’s not like we never see mistakes on the shortage report). As part of this reorganization, I am putting most parts in either sealed bins or zip lock bags, (the kind with the slider built in) in order to keep them clean. We have eliminated the table top bins where we kept the nuts and bolts by putting them on a rolling bin cart. We also used the table top bins for small parts. They were not in order because the bins did not move. It was also difficult to see what was in the bins and to get them out. Now, I am making kits for each subassembly which will include all of the small parts and fasteners required. 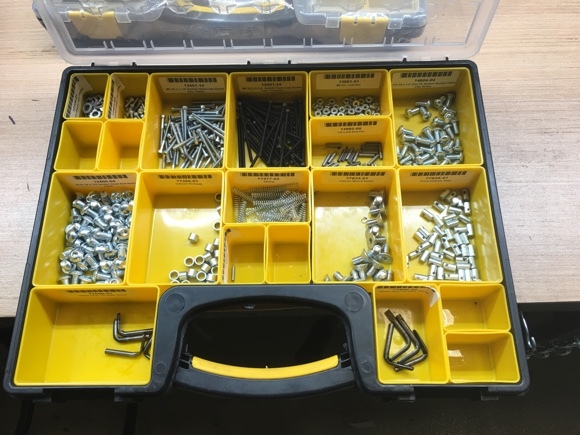 The fasteners are easily restocked from the rolling bin cart while the small parts are stored only in the kit. That kit is then kept on the shelf with the other components for that subassembly. Hopefully, this reorganization will continue to help us improve efficiency and help us maintain a significant pricing advantage over our competitors. 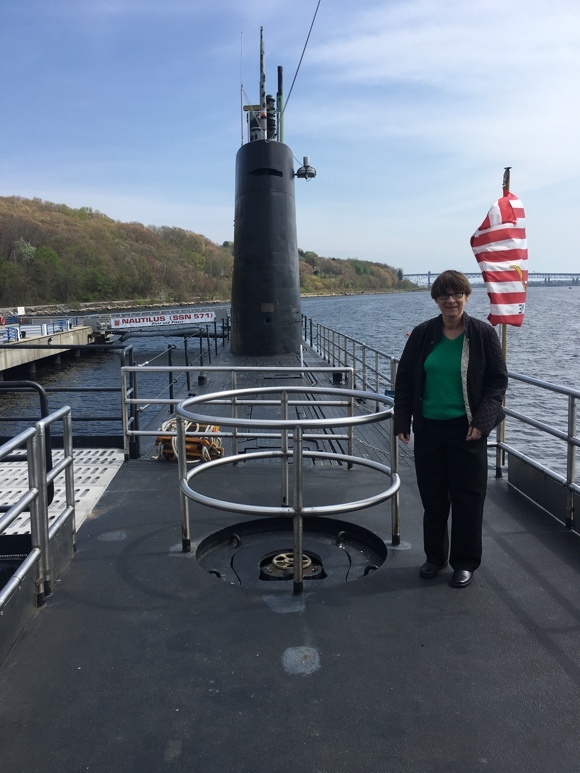 Last week, I wrote about our visit to the submarine museum in Groton Connecticut. We were there to do a demo on Fishers Island, which is only accessible by ferry. The ferry only makes two crossings a day so we had to be at the terminal at 6:30. Any oversized vehicles, like ours, requires a reservation. The cost for my Sprinter was $128 plus $25 per person for a round trip. You have to back on to the ferry. They take the cars first so they can park under the main cabin, then they take the oversized vehicles and place them to balance the load. The crew was very efficient and friendly. Once the vehicles were loaded, they took on passengers. We were struck by the number of kids getting on board, all with back packs. It was a school day so we guessed it must be some kind of field trip. Later, at the demo, we asked the equipment manager about it. He explained that there is a school on the island but that there are not enough kids who live on the island to justify it, so they import kids from the mainland. He said they are mostly military kids from the local submarine base. For enduring a 40 minute ferry ride, they are schooled in average class sizes of 10-12 students from some of the best teachers in the area. There is one school building for 1-12 grades. Probably one of the best public educations in the country. I also want to welcome MTE (formerly S V Moffet) as a new dealer covering New York and New England. MTE received the 2015 Global Dealer of the Year, the 2016 North American Dealer of the Year for Jacobsen and is the Number One Ventrac Dealer five years running. Let's also remember are fallen Military on Monday with a moment of silence at 3pm. My wife and I travel regularly for business and when time allows, we like to take in a tourist attraction. We really enjoy museums, especially those that feature technology. 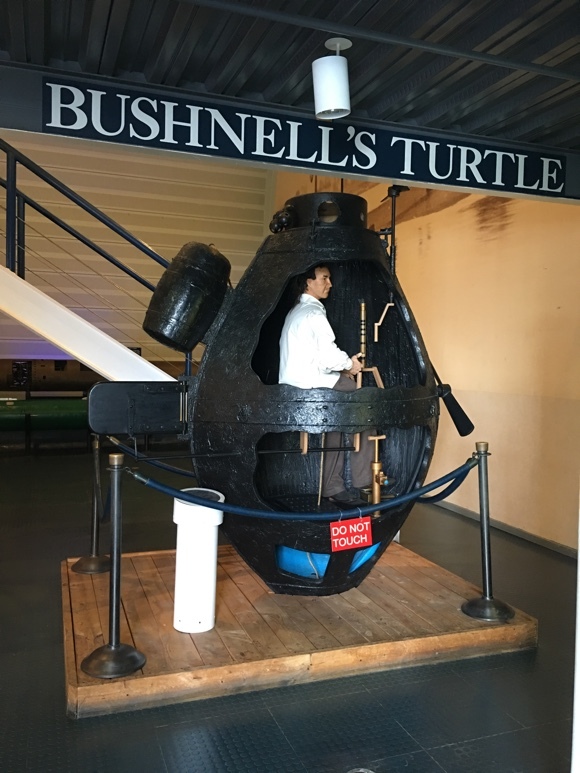 On this last trip, we went to the United States Navy Submarine Force Library and Museum in Groton Connecticut. One of the most interesting exhibits is replica cutaway of Bushnell’s Turtle, the world’s first documented submarine. It was used, unsuccessfully, in 1776 to attach bombs to the hulls of British ships. I had known about this sub but when I saw it this time, I was struck by something odd. It had a propeller. A little research reveals that it was, in fact, the first boat to use a propeller. It wasn’t until the 1830’s that experiments on propellers began in earnest and it took until the 1880’s for the technology to be fully embraced. We also went aboard the USS Nautilus, the world’s first nuclear submarine. It was also the first submarine to complete a submerged transit of the North Pole. The self guided tour was of the forward section and did not include the nuclear or aft sections but it was still fascinating. Compared to the submarines of World War II, It was almost space age, but compared to today’s technology, it was pretty crude. It took a special kind of hero to serve in those cramped and dangerous conditions. If you are ever in Groton, this museum is well worth a visit. It only takes a couple of hours and it is free. 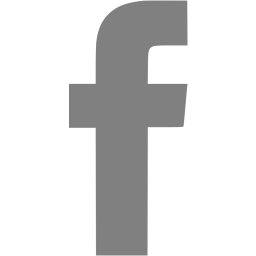 A couple of weeks ago, I posted a blog, Frustration Paradox. I had written the blog a couple of years ago but never finished it. I remembered it after visiting Mark Wynicott, the equipment manager at Boca West. Mark has purchased seven grinders from me over the last 15 years. Just as important, his apprentices are sought after to become equipment managers at other courses and they buy a lot of my grinders. That is Mark standing next to his old Ideal 1100 and his brand new Ideal 6000. The 6000 replaces a 15 year old Ideal 1000, not because it wasn’t working but because his techs would rather wait in line to use the 1100. Both the Ideal 1100 and the Ideal 6000 are a result of the Frustration Paradox where money was tight but we had a lot of extra time. The one legitimate knock on our grinders was they didn’t look pretty, so in 2006, I began to redesign the 1000 to make it look prettier. I spent about a week when I realized this was stupid. There were enough things I did not like about the 1000 that I decided to start with a clean piece of paper. The results were the 1100. In 2008, our supplier refused to continue stocking the custom motors we used. I decided it was a bad idea to use custom motors just to save a few inches of length but rather than just tweak the design and even though it was by far the best grinder on the market, there were enough things I didn’t like so I pulled out another sheet of paper. This time, I came close to perfection in that the basic design can’t really be improved on but lends itself well to improvements. So after only two years of production, the 1100 was replaced by the 6000. 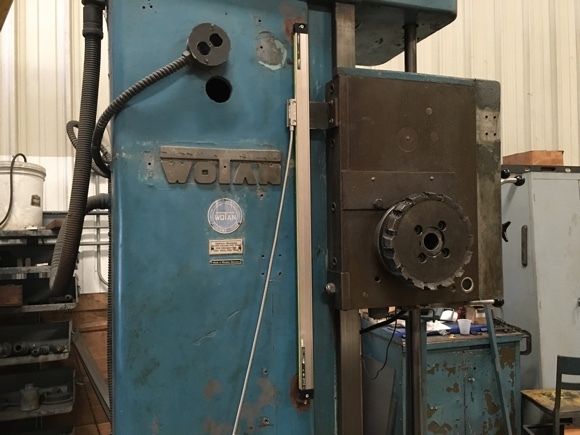 The 1100 and 6000 share about a dozen parts that we make, the rest are all new, so even though the machines look the same, there are a number of major differences. The end caps of the 6000 are open for easier access and loading. The door is much lighter with easily purchased and replaced panels (available at Lowes and Home Depot). The air springs on the door have been eliminated. The component panel and switch box are much easier to access. The dog house enclosing the grinding motors is more easily removed for service. It is easier to access the cylinder which now includes quick return travel stops. The top face and front face grinding motors have been reversed so a right handed person can reach both and still keep an eye on the grinding. There are better wipes and a shield on the carriage. The pallet toe clamps use a knob instead of a ratcheting handle for easier operation. The bottom support pallet clamps have a simpler design for easier operation and it has a prettier paint job. I introduced my first all new reel grinder, The Peerless 2000, at the 1994 Dallas GCSAA show. It used the same pneumatic rodless cylinder technology I had been using on the Ideal 65 Bed Knife Grinder for several years. It went into production in the summer of 1994 but in the spring of 1995, we received several reports of erratic operation so I decided to replace the cylinders. The problem was the grinders were spread out over half the country and I did not have anyone trained in the field who could service them. I decided to go myself. I called my cousin Kurt, who was a retired truck driver, to see if he could help me with the driving and he agreed. The week started with a demo I agreed to do in south Florida. So I headed down on Sunday night but could not find a hotel. I couldn’t do a search because my cell phone was a Motorola Brick about the size of a mail box and all it could do was make phone calls. I found a hospital where I could park for the night. I used their emergency room bathroom and went back and slept in the van. Back then, I would use wooden ramps and a come-a-long to unload and load the 2000. So I go to the course and he wanted me to grind 5 pull behind Toro Spartan mowers. I did not know how to say no then so I did not leave until maybe 4 pm. 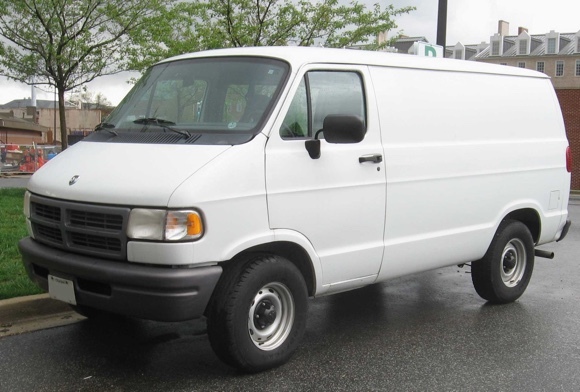 I got back to Tampa about 8, unloaded the grinders and reinstalled some aftermarket seats in my 1994 short wheel base Dodge Ram Van. I showered and took off to meet my cousin at a truck stop in Jacksonville. I got half way there on a lonely stretch of Hwy 301 when I had to pull over and take a nap. I had been asleep for maybe 30 minutes when I heard a train whistle that was so load, I was sure I was on the tracks and about to be hit. For a split second I pondered wether I should move the van or just get out and run. I chose the later. A few moments later, outside the van, I realized I had not parked on the tracks, they were across the road, but that the still night air had let the sound travel. I wasn’t going to sleep after that so I drove on to Jacksonville and met up with my cousin. He was well rested so he took over the wheel and drove to North Carolina for our first stop while I slept in the back. We pull into that first course around 10 AM Tuesday morning. It took me several hours to make the repairs and we were off for Rhode Island. We shared driving duties until about 2 AM when we both napped for about an hour. It was pretty cold and uncomfortable so we took off again at 3. We got to the course in Rhode Island about 6 AM on Wednesday, so we napped until they arrived at 7. I made the repairs and did a little additional training before we took off again. As we left, Kurt mentioned that he had a step daughter an hour up the road on our way. We were a little ahead of schedule so he used my Motorola Brick to call her. He had to leave a message. She called back just as we approached her exit. She fed us and let us shower and we were back on the road, well fed and refreshed. We were headed for Michigan for the last stop which was supposed to be on Friday, but Kurt felt we could drive through the night and arrive early enough to fix that machine. He was right. We left there in the late afternoon. I suggested we get a motel room before the long drive home but as he put it “I can smell the barn so lets just drive home.” I dropped him off in Jacksonville and was home by 10 Thursday night, a whole day early. Even at that young age, It took me all week end to recover. I did learn one thing from my cousin about cross country driving, always have one sit down meal a day. “The last seven or eight years have been tough. The economy has been sluggish and the golf course industry has been especially hard hit. In 2005 they were bragging “One new course a day”. Even that was pessimistic as the total that year was over 400 new courses opening. The decline began when the housing bubble burst resulting in the construction of fewer golf communities. For at least the last 5 years, more golf courses closed then opened. In 2013 there were 14 new courses opened in the US and 157 closed. When business is slow, it is easy to focus on cash flow and nothing else. What you do have in abundance though is time. We chose to spend that time and what little cash we had in product development. In 2007 we designed an all new bed knife grinder, the Ideal 1100 which had dual fixed heads and was fully enclosed. In 2008 we then did a major redesign of our reel grinder to make the Peerless 7000. Like the bed knife grinder, we started with a clean piece of paper and built a prototype of a completely different table concept. We figured out that the new design created more problems than it solved, so we returned to the original concept. We worked on the design to make it less expensive to manufacture and better looking by eliminating all external welds. The redesign also included a power door and a new, simplified automatic indexing mechanism for relief grinding. Another feature of both grinders was adjustable legs that let the customer set the height of the grinders. This meant that the hydraulic foot pump operated lift table we had been selling would no longer go high enough. We designed our own lift table using a two stage, air assisted transmission jack. It was awful. The basic lift table was fine so we adapted an ATV winch motor and commercial grade battery jumper pack to make the Simplex 500 lift table. It is unique in that it allows you to pick up and move any cutting unit with out you picking up the cutting unit to put it on the lift. In 2009, we lost our supplier of custom built motors for the Ideal 1100 bed knife grinder. We did a minor redesign to accommodate a standard motor but decided there were enough little things we didn’t like so we did a major redesign to address those issues. This resulted in the Ideal 6000 bed knife grinder. One of the smartest design decisions I made (for the wrong reasons) was to make a pallet system on the 1100 then 6000 bed knife grinders. I did it so you could preload and align bed knives and then just swap out the pallets. That did not prove very practical as the pallets were very heavy. Then one of my customers threatened to replace his 1100 with a competitor’s grinder because he thought it was faster to load and operate. It wasn’t but I wasn’t going to argue with him, so in 2010, I developed the pin alignment system for our bottom support pallet. 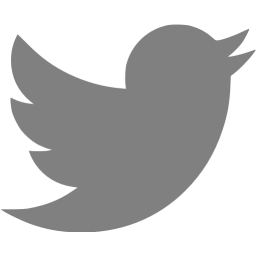 This resulted in loading times being reduced from several minutes to 30 seconds. It also added the function of grinding the front face of the bed knife parallel to the mounting bolts. In 2012, I was making a presentation to Toro engineers. They liked the bottom support with the pin alignment system but wondered about being able to grind both faces of the bed knife parallel to the pivot mounting bolts. It is a long drive from Minneapolis to Tampa and by the time I was home, I had the idea for the V-Support pallet. Of course this was possible because of our pallet system. Now the customer can choose either one or both. Then one enterprising customer figured out how to grind bed knife shoes with this pallet so we designed a kit based on his concept. The last almost two years have been much better for sales but that has kept me pretty busy trying to catch up on our sales back log. This has prevented me from doing much product development. 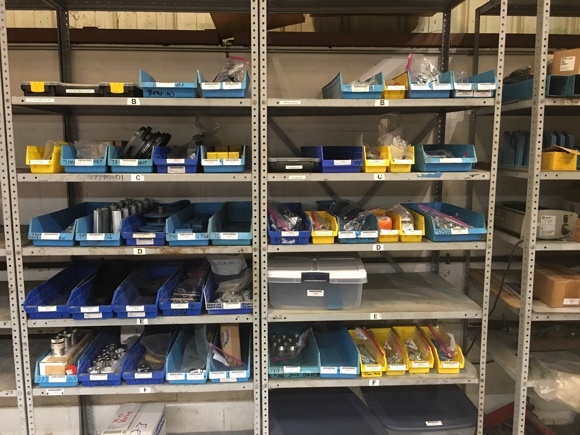 We are finally fully staffed so we are seeing are productivity return with a lot of parts and components in the pipeline. I believe that we will be caught up sometime this summer which will let me return to product development. We did have one new product this year from which we are getting very good feed back. 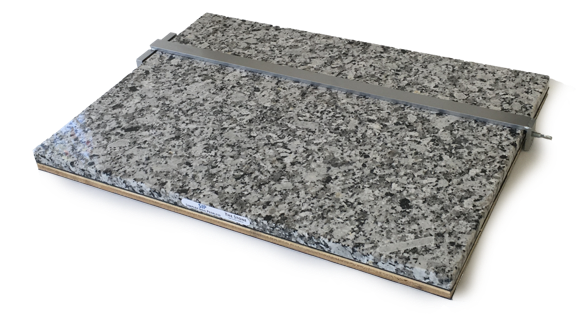 The Stone is an affordable granite plate for setting up cutting units. My ultimate goal is to have both robust sales and a very active product development program at the same time. I had been trying for years to meet with Stephen Tucker and demo my grinders. He would have none of it. When the folks from IGCEMA would come and visit me in my booth, he would stand outside and wait. I finally caught a break and he agreed to look at my grinders even though he wasn’t really in the market. I went to his course and could not finish the demo because we kept going off on tangents. I went back for a second day of demo. Fortunately the course he was at was only 30 minutes from my house. We discovered that we had very similar ideas about cutting unit maintenance. One of the last things he asked me was why I did not have a Digital Read Out on our reel grinder. I explained to him that I had look into it and all that was available were two or three axis systems with long scales and that they could be temperamental. These systems were also very expensive, What we needed was a single axis with a short scale. Even though it was only a thirty minute drive home, that was enough time for me to realize that it had been a while and it might be worth a second look. I found that Mitutoya had adapted there digital calipers with a six inch scale to be used with an inexpensive single axis read out. It was perfect for our grinder and took very little effort to mount it on the Peerless 7000. I had originally thought this would be an option for the course with too much money until I started using it. It is much easier to use and is at the same time, more precise. We now ship roughly 60% of our grinders with this option. I am reminded of this story because a month ago we had to replace the DRO on our milling machine. We have had it for about 17 years and have had to replace the scales on it once. Then two weeks ago the DRO on our main lathe went out again. We had replaced the scales about 10 years ago. This time the counter went out two. Both of these systems were made by Accurite and used glass etched scales with an optical reader. The problem with these scales is that a little dirt can disrupt or damage them so we had to regularly disassemble and clean them. Finally, one of the scales on our boring mill went out. That is the machine that we use to precision machine our 6000 and 7000 tables. The difference is that this DRO was made by Mitutoya and had no problems for the 20 years it had been installed. It still had the glass scales but they were either better protected or less susceptible to dirt. We decided to replace all three systems with the newer Mitutoya which uses a magnetic scale instead of a glass etched scale. This system is not affected by dirt and is more robust. And it is the same system that we have been selling as an option on our Peerless 7000 for years. As you may know, I travel about 10-12 weeks a year not including trips in Florida and I cover everything east of the Mississippi River. Larry covers everything west. I dread these trips. I usually have to leave Saturday or Sunday and don’t return until the following Saturday night. The last time was one am Sunday because of stop and go on I 95 all the way through South Carolina. The trips are easier now that my wife, Michele, is retired and travels with me. I do enjoy meeting and talking with customers because I always learn something and I love to hear myself talk about my grinders. I also come up with my best ideas while traveling but it is a lot of work. It takes at least three full days to plan a one week trip. I first have to contact all the salesmen in the area and collect their sales leads. 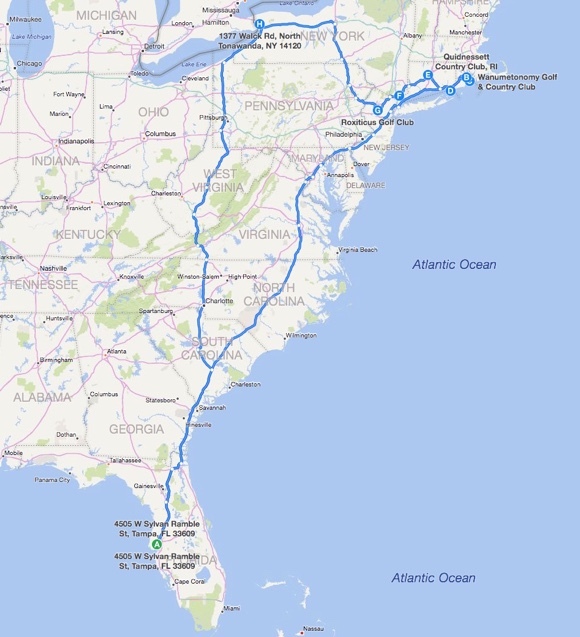 Once I have enough to keep me busy for a week, I layout my route on Bing Maps. I send each salesman a tentative date for them to get approval from their customer. There is usually a little back and forth before the schedule is finalized. Once set, I will do research on each course and enter that and the contact information into my data base and then print out a sheet for each course. One of the most time consuming parts is locating a good and reasonably priced hotel. I used to just go the golf course the night before then pull out my AAA guide book. This lead to a few nights where it took me several hours to find a place to stay and more than one night of sleeping in the truck. Now I can use Bing Maps in conjunction with several other web sites to pick a hotel and print out a coupon if necessary. I don’t usually make a reservation because my plans are always changing. I also worry about the Sprinter breaking down. I will also print out a satellite view of the course and see if I can identify and locate the maintenance facilities. Then, all of these pages are assembled into a notebook. A day or two before the trip, I will go through the van, check the tire pressure, oil and lights and do any additional cleaning. The day before, I pack up each days clothes in ZipLoc bags and replenish my toiletries. Once I get out and start meeting you guys, it is all worth it. You all remember Karl’s 1966 Mustang. The last thing we did was to add an aftermarket AC unit which then required that we install a massive aluminum radiator. We also took it to a small shop that fixed a bunch of little headaches. While he was working on it, he went ahead and steam cleaned the engine and repainted it back to Ford Blue. The previous owner had painted different parts of the engine neon green and orange. It was embarrassing to open the hood. All of these things made the car much more enjoyable as a daily driver but one problem persisted. The exhaust pipe doughnut will disintegrate after only a few months. We thought about making a reinforcing bracket but I did some research and came up with what looks like a much better solution. Clifford Performance out of California specializes in performance upgrades for older 6 cylinder engines.The kit shown above is for Ford 200 which has several issues. The biggest issue is that the intake manifold is cast as part of the head and can’t be replaced. It does not feed the number one and six cylinders very well. Also, the exhaust port for the three and four cylinder are siamese (the same port) so it runs hot. 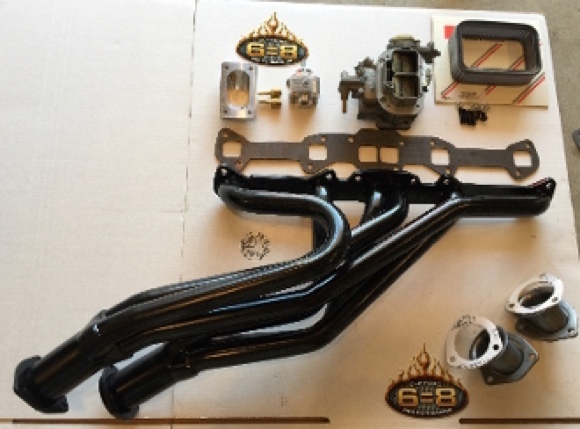 This kit include a dual exhaust header, an exhaust port divider for the 3-4 cylinder, a Weber 2 barrel carburetor with a small high rise venturi adaptor and all the necessary extras. It costs just over $1,000. We figure another $200-$600 for the 2-1/4 dual exhaust, depending on if we go stainless. The combination of the headers, riser and caruretor is supposed to solve the problem of the intake manifold breathing. It is also supposed to increase horsepower and torque by 50%. The fuel economy should be 16-18 mpg which is better than the 11-12 mpg he is getting now. This kit looks relatively inexpensive and should solve most of the drivability problems. I will let you know how it goes. One of the more difficult units to set up is the older John Deere 2500s. The front roller adjustment is an eccentric which is locked in place with a bolt thru the center of the eccentric. The problem is that the adjustment is effectively blocked by the frame so the only way to adjust it is with a socket, but you can not tighten the locking bolt with the socket on the eccentric. When you remove the socket and tighten the locking bolt, the eccentric will move. This is most aggravating when trying to set up a reel that you have measured with the pi tape and it is perfectly cylindrical. 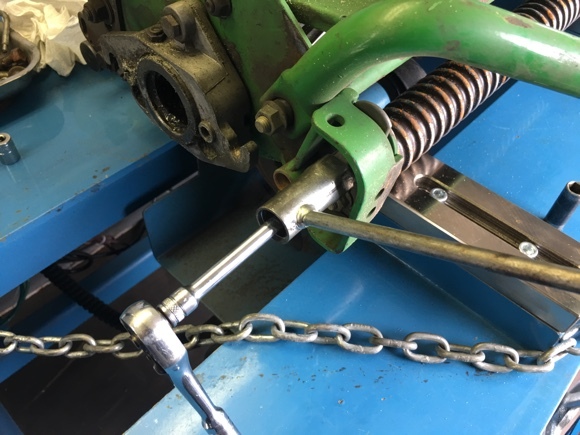 You can move the grinding head from end to end and should hear a constant light contact between the grinding wheel and the reel blades. A few thousands difference is really noticeable, so you loosen and tighten the locking bolt and try to guess how much the eccentric is going to move. It does not repeat very consistently. 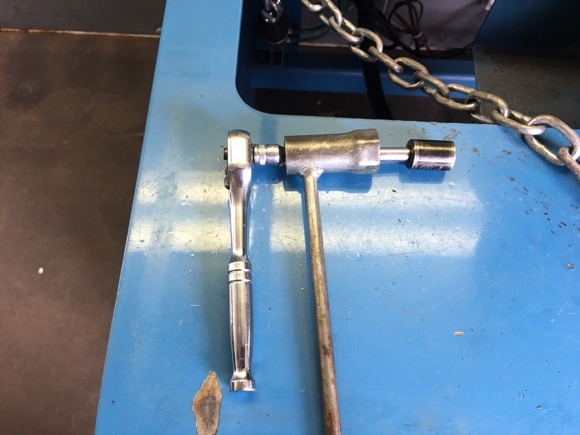 About a year ago, I learned of a trick of using a small engine spark plug wrench which fits on the eccentric while using a quarter drive 13mm socket, extension and ratchet on the locking bolt. This allows you to hold the eccentric from moving while you tighten the locking bolt. Last week during a demo, I had the opportunity to try it. I had bought one of the spark plug wrenches last year but did not know what size the locking bolt was. When I tried it, the socket was too large to fit into the spark plug wrench. The tech at the demo said he had one of those wrenches so he went off to get them. We originally tried his deep socket and it fit into the spark plug wrench. There was not enough clearance, however, to accommodate the offset between the eccentric and the locking bolt. We then tried a standard socket and, Bingo, it worked. This particular reel also pi taped at less than .002 inches of taper but with these wrenches, I was able to adjust it once and got perfect contact all the way across on the first try. If you have these John Deere units and want to try this, make sure you take your quarter drive 13 mm socket with you to make sure that it fits in the spark plug wrench.